This combo bundle has a total of 57 cards and posters! Read on for more details on what is included! Each packet in this bundle sells individually for $4.00 each. You Save 25% by purchasing this digital bundled pack! Each packet sells for $4.00 each. Purchasing this bundle saves you 25%! 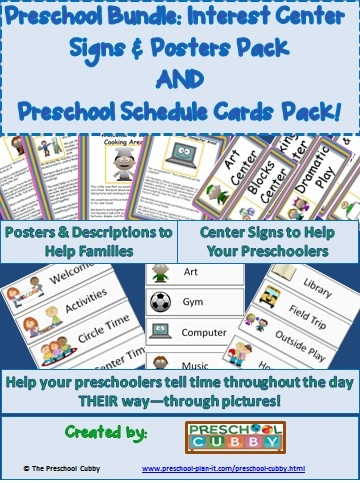 In includes 14 Interest Center Posters and 22 Interest Center Label Signs for your preschool or prek classroom! Use these to hang at each interest learning center at the beginning of the year, at open house, at parent conference time or any time families will be spending time in your classroom! 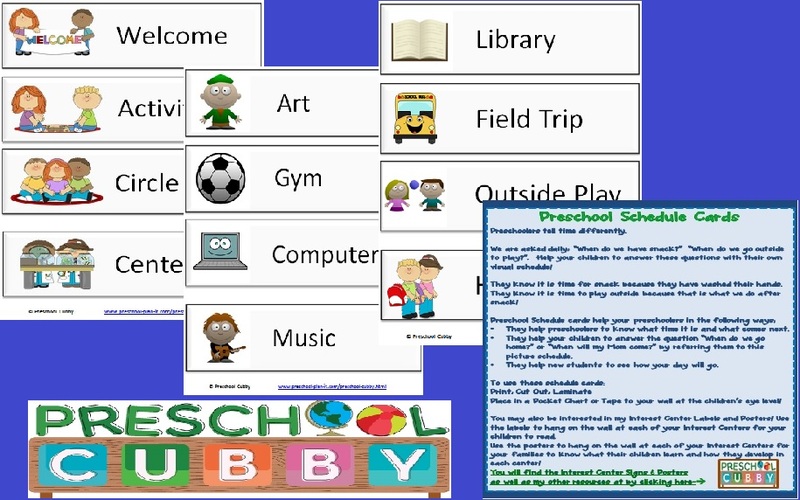 I have included labels for areas for the traditional preschool classroom and for specialist areas you may have in your classroom or other areas of your building. There are also blank cards for you to add your own! The labels signs are 11" X 4"
Preschoolers tell time based on activities-not by a clock! "What do we do next?" "Is it time to go home yet?" This preschool packet includes 21 Schedule Cards. They include the traditional times of day as well as cards for specialists and special days such as Show & Tell and Field Trip! There are also blank ones for you to fill in your own. 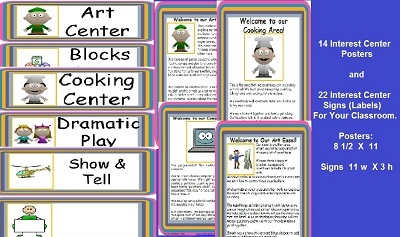 Use these schedule cards by laminating and placing in a pocket chart or taping directly to the wall.